It is now widely recognized that imperceptible low-grade inflammation is associated with modern diseases and accelerated aging. While life expectancy continues to increase, healthy life expectancy (the number of years free of degenerative disease and disabilities) has increased much slower. The association of inflammation with aging and disease is substantiated by documentation that those living the longest, including people living up to 110 and beyond, have notably lower levels of inflammation than the general population, which only rise as they approach death. The Inflammation Calculator (IC) is a tool to measure, monitor and manage otherwise imperceptible low-grade inflammation. Presently, medicine is confounded as to detection and treatment of low-grade inflammation. To date, over 900 inflammatory biomarkers (blood tests positive for inflammation) have been discovered, none of which point to the cause of, or targeted treatment for, inflammation. Nor has it ever been shown that decreasing an inflammatory biomarker, for example CRP (C-reactive protein, most commonly used as an indicator of cardiovascular risk) is of any benefit. Chem Screen, Lipid Panel and CBC … and yes, even when all results fall within “normal” limits. inflammation unique to each individual, within a multitude of test results. Certain fatty acids are designated first responders. Whether you are exposed to a toxin, get an infection, develop abnormal cells or stub your toe these fatty acids ignite inflammation. 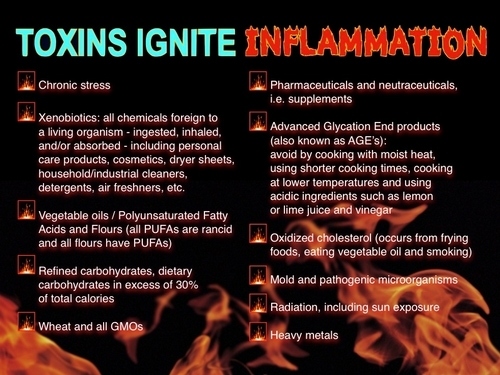 The purpose of inflammation is the elimination of toxins, abnormal cells, pathogens and damaged tissues. Detecting the activity of IFAs (inflammatory fatty acids) means detecting inflammation at the onset. You want to ‘nip it in the bud'. The IC is a tool to detect and help manage IFAs (inflammatory fatty acids) from runing amok before irreversible damage occurs and a chronic disease ensues. If toxin exposure, pathogens, abnormal cells and tissue trauma persist, so will IFAs ― they are self-propagating. Self-propagating IFAs establish and then perpetuate chronic inflammation and disease. IFAs provide the ideal breeding ground for autism, Metabolic Syndrome, Diabetes, heart attacks, strokes, Alzheimer’s, Parkinson disease, autoimmune disease and cancer. would be the ideal measure of inflammation. However, since they are so short-lived, i.e., seconds, they cannot be measured in blood tests. The solution lies in measuring their effects. The late Emanuel Revici MD quantified the effects of inflammatory fatty acids in blood and urine in his classic textbook, Research in Pathophysiology As A Basis for Guided Chemotherapy (1961). This is the basis of the Inflammation Calculator. Chronic inflammation is associated with modern diseases and accelerated aging, it is not the cause. Inflammation is a red flag, signaling cells under assault. Its purpose is to protect, heal cells or facilitate their demise when necessary. Anti-inflammatories shoot the messenger. Toxins must be eliminated. The IC algorithm not only turns the results of common, readily available, blood tests into an exquisitely sensitive detector of inflammation, it also points to possible causes of inflammation, the disease processes associated with inflammation and suggests steps to alleviate the inflammation. Copyright (c) 2017 Lynne August MD All Rights Reserved.